On the one hand, you could say this mansion-esque 3,100-square-foot Spanish Colonial Revival-style home embodies classic Upper East Side pre-war co-op charm–at a condo price. 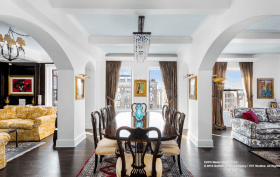 A Park Avenue address in Carnegie Hill usually means the former, as do the home’s 1928 bones, sprawling, palatial layout and stunning entry foyer. But this $9.6 million condo at 1235 Park Avenue is newly-renovated and though the price may be steeper, it comes with the flexibility a condominium generally affords.